There was much of both to be had this past weekend, which is both an excuse for my blogging absence and not one at all. That is, I blog when I’m much busier than I have been this past week, but I got a whole lot of sewing done, and then went to my first RUM, and it was both productive and awesome so I am feeling pretty good about the whole thing. This miniature has been what I’ve been obsessing about lately, and also is what I am basing my current set of garb after. 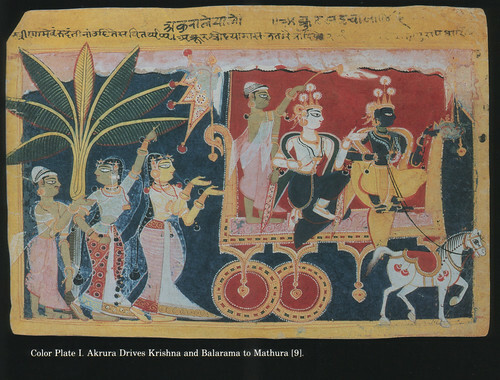 It’s in the book Indian Miniature Paintings and Drawings from the Cleveland Museum of Art, and it’s very informative. 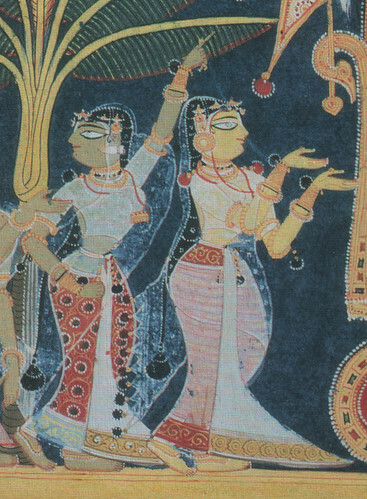 A great deal of the book deals with post-period and Mughal miniatures, but there is a significant section on pre-Mughal Rajput miniatures in the front of the book, complete with color plates (for some images) and close-ups of certain miniatures. I will scan most of these eventually and put them someplace accessible on the SCA_India list, but not tonight (we are stuffed with Persian food, and I am sleepy). Aren’t they lovely? Well, I certainly think so. Moreover, they are really useful references in my costume reconstructions, primarily because (a) you can see each and every bit of jewelry they are wearing very clearly, down to the fingers they have rings on, the little ties on their arm bands, the arrangement of pearls on their hair, and the beads on the tassels on their skirts; (b) the clothing details are great, showing the embellishments of the skirts, the embroidery on the cholis, and even the individual threads on the ends of their odhanis, where the tassels attach. I’ve been studying this image very closely for quite a while now. So. I got to things a little late, and was making tassels in the car (did you know that parandas are harder to make than they look? well, they are), but ultimately managed to get it all together, sans arm-bands. I knew this was going to be the leftover thing, so I used a piece of sari fabric (the blouse piece, actually, from a rayon sari that will find a use come DragonCon) for my choli, and the fancy gold borders became faux-armbands. 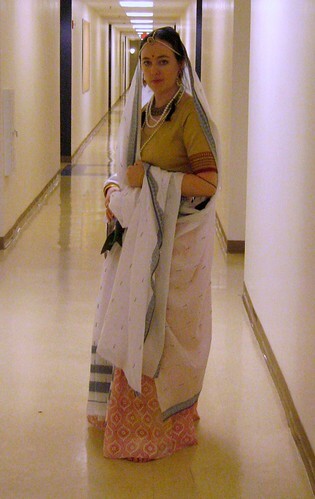 Another sari became both the patka (drapey fabric piece in the front of the skirt) and the odhani (veil). As you can see, I made the printed fabric into a rather voluminous skirt, and I am very pale, but it works somehow. The veil ought to be more sheer than it is, but I didn’t want to destroy a fine one, so the poly-cotton sari piece will do for now. The skirt ought to have a border around the bottom (probably printed, too) and the patka is still in the works. I had a long conversation with Madhavi about it, attempting to figure it out. I’m still working on it. And now that I see it not on my body (but in a photo on my body), the choli looks a lot better than I thought. I need to tweak the shoulders and armscyes, but it works decently enough. I will probably keep this outfit in rotation as the everyday garb, and do something fancy for court attire. I am learning chain-stitch embroidery. So. I met all kinds of awesome people, including (and perhaps especially) Madhavi and Greet, and I must say that it is nice to geek out over this stuff with folks who understand it. I spent a LOT of time with Madhavi. She is thoroughly awesome. Greet makes my brain hurt. Yeah, man. 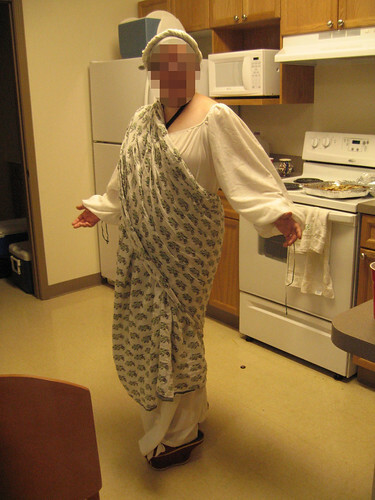 I wrapped that thing, and I was a little silly at that point, and it still doesn’t look like complete crap, and I think we’ve started a new fashion trend here, namely saris plus Italian undergarments and chopines. And that’s all, except the husband and I shared a twin dorm bed for the weekend, which was a little like college only not (because I am a square). Today I am going to spin some more blue yarn, and go to bed early. I am pooped (but already planning how I can make my garb more and better; I think I’ve made the right choice). That’s all. I have gone on long enough, and I think the rest can wait until tomorrow. 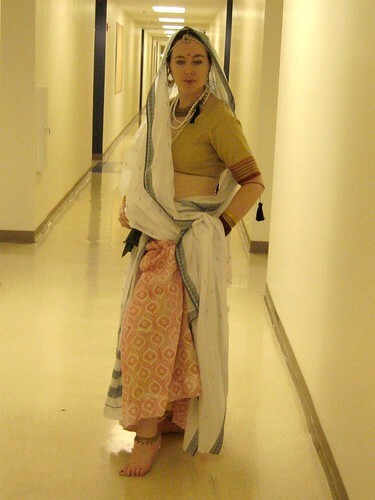 This entry was posted in Cool things, General stuff, india and tagged costuming, india, projects, sari, sca, sewing. Bookmark the permalink. 4 Responses to RUM, and rum. And i love the hand printed fabric… i recognized it even before i read the text… 🙂 And also Nice to see it as a skirt.. Thanks for saying so! I figure it can only get better from here, no? My next task is fabric with a border, or possibly zari-worked fabric. The skirt actually requires about a yard less fabric than I used, so I have a lot to work with for next time! Wow.. I’m floored at how amazing that handprinted fabric looks!